Take a tour of weaver Nancy Kennedy's California studio. Then, discover more design talent from around the USA in our Modern Across America issue, on newsstands now. In Eureka, California, Nancy Kennedy creates what she calls "art underfoot." 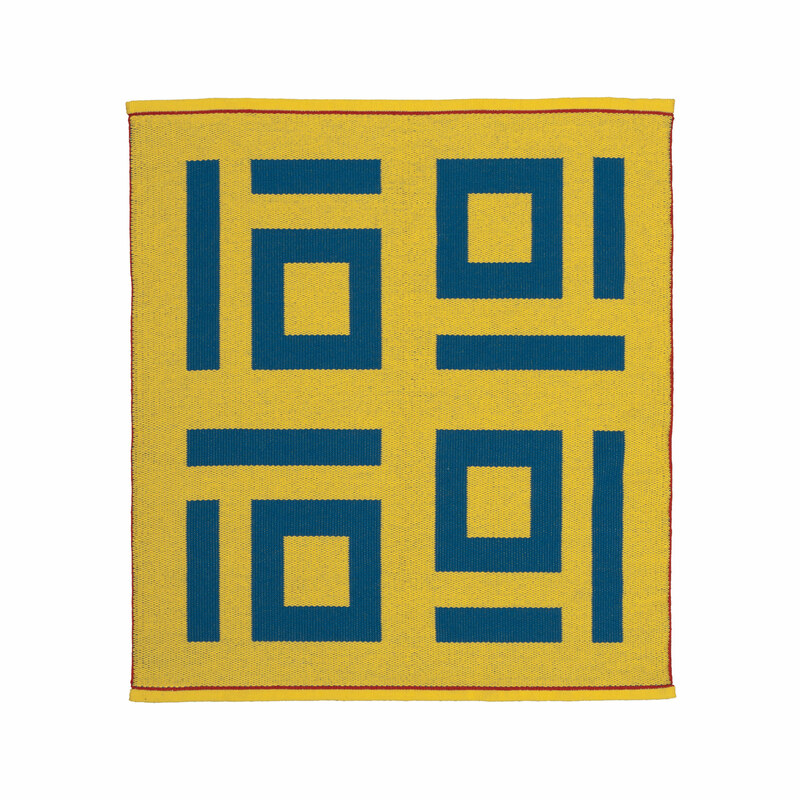 Since she discovered the art form in in 1990 and left her corporate job behind, Kennedy has created reversible, geometric compositions that update the ancienct craft of weaving. "I like contemporary decor, and am very fascinated with mid-century modern. I think my designs reflect those tastes," she says. "Working with color is one of the most fun components." What kind of loom do you use to make your rugs? "It was custom made for a technique called shaft-switching. I'm the second owner and long knew of the man who built it before the loom came on the market. When I bought it, the loom had been disassembled and on the previous owner’s garage floor for three years. Once I got the loom to my studio I needed to figure out how it went together. There was no instruction manual...an engineer friend helped set it up. After that, I was up and running." What's it like to work with this piece of machinery? "The loom can be very cantankerous and I have had to learn a few mechanical tricks to keep it in good repair. There are parts that are rigged with aircraft cable and it eventually breaks and needs to be replaced, sometimes mid-project. The brake mechanism consists of heavy rope, springs, turnbuckles, and bar-bell weights that hang from arms on the two large back beams. It is all mechanical, nothing automated. Some have asked me if it is some kind of work-out machine." Why is the loom so colorful? "Originally the loom was painted gun-metal gray. My partner, Jeff, is an artist, and he suggested that he would like to paint it bright colors. I agreed, and that is how it came to be the piece of art it is today. We have had artist friends tag it, so there are some interesting and varied vignettes on it." What is your favorite part of weaving? Working out the design and color on graph paper is fun. The weaving can seem tedious, but I guess I have the patience required for it. It consists of building up the pattern one row at a time. In a linear inch of weaving there are about 24-28 individual rows. It is gratifying to see the design take shape as I go along. Rarely do I change a design once it is down on graph paper. I enjoy the fact that I can physically operate my heavy-duty machine. It's easier to say what the least favorite part of making a rug is. That is the hand work once it is cut off the loom. There are hundreds of tag ends from where I changed colors or had to refill an empty shuttle. I sew them all back in to hide them rather than simply cutting them off. Then I hand-hem the rugs. I would only leave fringe if someone absolutely insisted. I am not a fan of fringe on rugs! So far, no one has insisted on it. What do you wish people knew about weaving? I wish people appreciated the value of hand-crafted art, be it textiles, paintings, photographs, furniture, ceramics, or glass. Yes, they can go to a chain store and buy an inexpensive mass-produced rug that will probably be serviceable enough. I am always so appreciative when people “get it” and don’t wonder why the prices are high. It takes a long time for me to design, weave, and finish a rug. I love what I do, but still have to be compensated. It is not a hobby! There are a few of us rug weavers around the country and I consider some of them to be friends and compatriots rather than competition. We have been known to steer potential customers to each other when a customer is looking for a style other than our own. I consider the big box stores and furniture stores that sell mass-produced work to be the real competition. What does it mean to be a maker based in the U.S. today? I hope it means that we are educating the public to appreciate hand-crafted work. When someone purchases one of my rugs, they are investing in something unique. They are buying a piece of me and a story behind any given rug. I want to make rugs wider than the weaving width of my loom by weaving two or more pieces and joining them together after they are cut off the loom.